For the love of life: Winner, Winner JustRite Winner!!!! Well, since I am a pretty lucky person, my blog was randomly chosen to be one of the 6 JustRite Blog Candy give away blogs!!! Yaaaaaaaaaaa...I love giving away candy!!! Funny thing is, that I really was going to do my own blog candy giveaway this week, but time and projects just got in the way, but hey, I am still giving away candy...hehehe...don't you love it? OK, so what is the lucky winner getting???? Get ready to be swoon! This is one awesome blog candy! It was so worth to leave comments to have a chance to win these goodies. 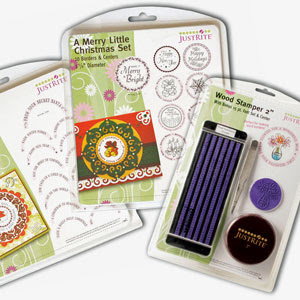 But let me not blabber, here is the picture of what the lucky winner is getting direct from JustRite Stampers. And here is an awesome tutorial Beate did on how to use these stamps, that I just loved, so I thought I would share it with you. You can see how easy they are to work with. So, now let's see who the winner is. I had 220 comments and I just want to say Thank You from the bottom of my heart! They were the sweetest most beautiful comments, and they just kept coming to my amazement! I am so grateful for them. I also wanted to publicly thank JustRite Stampers for their generosity! They provided me with so many amazing stamps of theirs and yes, I am officially addicted, so you guys will be seeing a lot more of these stamps in my designs...wait till you see some awesome Christmas ones and gorgeous every day cards! I am also so grateful to have been invited to play along the other 53 amazingly talented artists....you are all artists in my eyes, each and one of you and I am just so happy that I got to participate....Ok, so before I get anymore mushy, here is what Random.org pulled as the lucky number from the 220 people. So Heidi, please e-mail me your address to edobilas@gmail.com as soon as possible, so JustRite Stampers can send out your awesome goodies. I know you will love them as much as I do!